Every item in the Bill of Rights is given to every individual, it’s not given to groups, but today, the Supreme Court says the purpose of the Bill of Rights is to protect the minority from the majority. Now how stupid is that? Because I’m in the majority as a white guy, do I not get the right to a trial by jury, do I not get the right to free speech? No, because I’m in the wrong group. And so, what happens is even back in 1992, in a Supreme Court case I was involved with, the court at the time created classes of religions and if you’re in Christianity, that’s the biggest religion so we give you the least protection. But if you’re in a small religion, we’ll give you more protection than anyone else. Keep calm and speak freely, Mr. Barton; you have all your First Amendment rights. Even though you are a white Christian, you can have a trial by jury if ever you need one. What hubris to think minorities have it better than you. I can’t think of a better way to illustrate white Christian privilege than these statements. It is of great importance in a republic not only to guard the society against the oppression of its rulers, but to guard one part of the society against the injustice of the other part. Different interests necessarily exist in different classes of citizens. If a majority be united by a common interest, the rights of the minority will be insecure. There are but two methods of providing against this evil: the one by creating a will in the community independent of the majority that is, of the society itself; the other, by comprehending in the society so many separate descriptions of citizens as will render an unjust combination of a majority of the whole very improbable, if not impracticable. The first method prevails in all governments possessing an hereditary or self-appointed authority. This, at best, is but a precarious security; because a power independent of the society may as well espouse the unjust views of the major, as the rightful interests of the minor party, and may possibly be turned against both parties. The second method will be exemplified in the federal republic of the United States. Whilst all authority in it will be derived from and dependent on the society, the society itself will be broken into so many parts, interests, and classes of citizens, that the rights of individuals, or of the minority, will be in little danger from interested combinations of the majority. In a free government the security for civil rights must be the same as that for religious rights. It consists in the one case in the multiplicity of interests, and in the other in the multiplicity of sects. I am not saying that Stephen Bannon would approve of this but I think he should go out of his way to denounce it if he doesn’t. Here is Andrew Anglin of the Daily Stormer on Bannon and Trump’s Holocaust proclamation (which didn’t include any reference to Jews being the principle target of the Holocaust). For the most part, Donald Trump does not have any strong beliefs. That is to say, no specific strong beliefs. He wants to bring the people together and make America great again, and he wants to take the best path possible to that goal. As such, it is extremely important that he is surrounded by the best people possible. And Bannon is the best man possible. He is 100% /ourguy/. Who do you think came up with the idea of writing a Holocaust Day message that didn’t include any mention of the Jews? That’s not something Trump thought of himself, and it certainly isn’t something that could have been done by accident. The more Bannon we get, the better. Just as the less Kushner we get, the better. Perhaps Bannon doesn’t care about what is said about him. And for most people, that isn’t a completely bad idea. However, when you advise the president and sit on the National Security Council, there is a higher standard. While I am not prepared to believe Bannon is affiliated with neo-Nazi groups, I also think vigilance is necessary given the administration’s mixed signals and confused message. This and other gems can be found in an interview with Metaxas conducted by Emma Green for The Atlantic and out this morning. Green interviewed Metaxas at the March for Life and then followed up with an email about Trump’s controversial travel ban. Probably, I shouldn’t be too surprised since Metaxas said he used David Barton’s materials to help him write his fact-challenged book, If You Can Keep It. No, the media doesn’t need to learn anything. They need to proceed on the basis that facts should be verified. Metaxas told Green: “It undermines democracy even if there’s a perception of voter fraud.” We agree there. And that’s why it is irresponsible for Trump to continue claiming without evidence that millions voted illegally. Finally, on the immigration ban, Metaxas reveals that he hasn’t read that much about it: “As far as I can tell from my limited reading, the order is not what so many are saying it is.” My answer is that he needs to read more. He could start here, and then here and especially here. Perhaps, he should read this report as well. “It is with a heavy heart and somber mind that we remember and honor the victims, survivors, heroes of the Holocaust. It is impossible to fully fathom the depravity and horror inflicted on innocent people by Nazi terror. “Yet, we know that in the darkest hours of humanity, light shines the brightest.‎ As we remember those who died, we are deeply grateful to those who risked their lives to save the innocent. John Podhoretz caught it. So did Jake Tapper. And then according to CNN’s Tapper, White House spokeswoman Hope Hicks said, “despite what the media reports, we are an incredibly inclusive group and we took into account all of those who suffered.” Words really don’t have much meaning anymore. Yes, the Nazi’s killed anyone opposed to them, but they singled out the Jews because they were Jews. The statement is a tip of the hat to those who minimize the Holocaust. Evangelical leaders (you know who you are), I hope your Supreme Court justice is worth your support for the alt-right, white nationalistic, xenophobic, and incompetent elements you have enabled since the primaries. 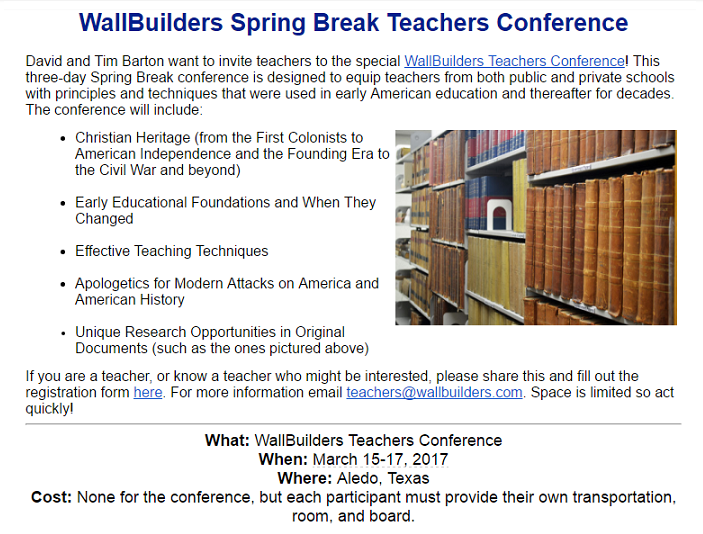 Instead of relaxing and refreshing, school teachers can now look forward to several days with David Barton over Spring Break. Barton left off some of the “how-to” topics he should cover. How to omit pertinent historical facts from your presentations. How to turn fiction books into sources of historical facts. How to cite only the statistics you need to support your position. How to demonize people who point out your mistakes. How to claim you have an earned doctorate when you don’t. Recall that Gateway Church founding pastor Robert Morris told his congregation two weeks ago that God wanted him to break the annual churchwide fast in order to eat the food served at Donald Trump’s inauguration. According to video served up by the Family Research Council, Morris did more than attend the festivities, he helped sponsor them. 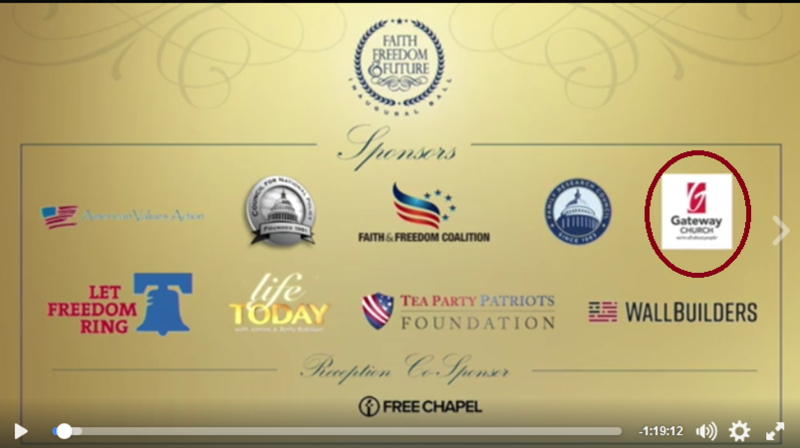 Gateway Church was one of nine sponsors of the Faith, Freedom and Future inaugural ball hosted by FRC’s Tony Perkins (Gateway Church, the only church involved, is circled in red below) in celebration of Donald Trump’s victory. Tony Perkins gave a shout-out to each sponsor. I don’t know what it cost to sponsor the formal affair but, in my opinion, that money could have gone to a more important purpose. In this season, 60% of students showing up on Wednesday nights at Gateway NRH come from families who do not attend Gateway or another church. We’re reaching our community! We’ve served pizza on these evenings for many years, not for hype, but to be helpful. To ensure we steward our budget well as we grow, we’ve started charging $2 per plate (two slices of pizza, desert and a bottle of water). $2 a week seems small to most of us, but it is not possible for some families. I’m okay with giving “free” pizza to those in need, but there’s little lasting value in a freebee. If you would like to purchase one or more pizza tickets for us to bless students with, email us at studentsNRH@gatewaypeople and we’ll send you instructions for either a cash or card purchase. I know one way Gateway could “steward” the budget better. It seems to me that pizza for needy kids should be easy for a church that can afford to co-sponsor a presidential gala. Tickets sold for $450/person and rooms at the Hyatt Regency Capitol Hill (where the ball was held) were $1000/night with a four night minimum. This was no pizza party. According to the youth pastor, a donation to the pizza fund shows caring for those needy students. 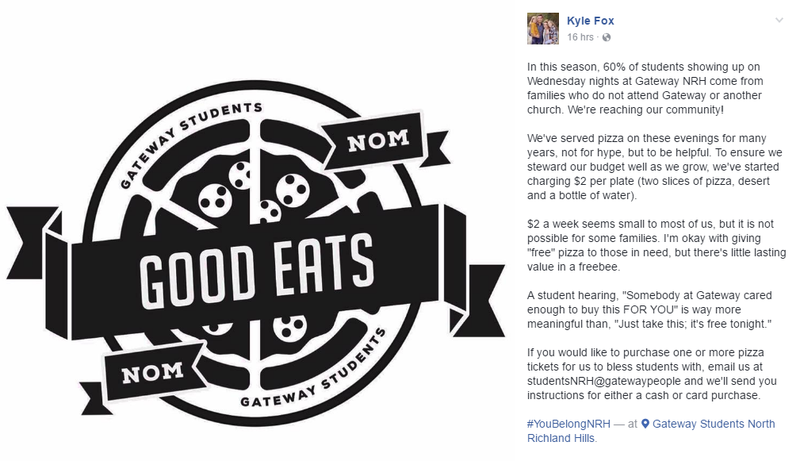 What does it show that Gateway’s leaders lavishly spend tithes and offerings to celebrate a Trump victory but can’t spring for pizza? C’mon Gateway, your donors have already given their tithes and offerings. Can’t the kids have some pizza on the House of God? Writing for OneNewsNow today, David Barton claimed to know the thinking behind the protestors who descended on Washington DC during the inauguration weekend. Without providing any polling or even anecdotal evidence, he said the protestors were unaware of the reasons why a candidate for president could win the popular vote but lose the election. He said the protestors were unaware that America is not a pure democracy. Somehow, Barton knows the views of all those protestors. The protestors believe that only the national popular vote matters (which Hillary won – barely). But even though she garnered the votes of most of the largest cities in America, she did not win the majority of the states, cities, or counties. In fact, Trump won 30 of the 50 states, more than 80 percent of America’s 3,141 counties, and an equally lop-sided percentage of its 35,000 cities. The protestors were unaware (as are most Americans) that the Constitution establishes an election system that balances diverse measurements. Shame on schools for not teaching the Constitution. How does he know this? Because some of the protestors carried signs saying, “Trump is not my president.” Of course, legally Trump is the POTUS. However, I suspect many of the protestors know that but had a different meaning in mind. They don’t believe Trump represents their beliefs and values, or that he is someone they can be proud to call president. Thank God for the freedom to protest and express one’s views. After ranting and mind reading a little more, Barton pronounces more shame on the schools. Shame on schools for teaching students to elevate personal opinion above absolute facts. Speaking of facts, I cannot help but point out that Barton ends his article with a quote that cannot be found in Lincoln’s writings. This is a quote Barton himself once said couldn’t be confirmed. After awhile of looking for this quote in Lincoln’s works, I got that familiar feeling that this was a misattributed quote. Indeed, I can’t find it in any Lincoln source or in any reputable source about Lincoln. I could find no instance of the quote with a citation of anything Lincoln said or wrote. So after shaming schools for questionable sins, Barton blatantly commits an actual one. Who should we blame, Mr. Barton or his schools? Which Donald Trump Did Eric Metaxas Support? From this day forward, it’s going to be only America First. Most who have truly loved America have done so with a conviction that we are, to use Lincoln’s phrase, God’s “almost chosen people.” We have been abundantly blessed not for ourselves, but so that we could be a beacon of hope and freedom to the world, not least for people like my parents, who sailed to these shores from war-torn Europe in the 1950s and who, when they passed the Statue of Liberty, were enraptured and emotional, knowing that the liberty it represented was not just a word but could be a way of life, one they hoped to embrace and pass on to their children, and now have, by God’s grace. Metaxas doesn’t seem to hear the “America First” part of the promises from Donald Trump. Metaxas wants us to believe that America has been brought into existence by God to help others. Trump seems to favor a more nationalistic set of values. Author Warren ThrockmortonPosted on January 23, 2017 Categories Donald Trump, Eric MetaxasTags donald trump, Eric MetaxasLeave a comment on Which Donald Trump Did Eric Metaxas Support?